Born in Juarez, Mexico, and raised in Dallas, Texas, Marka27’s foray into the art world began on the city’s streets mastering the art of graffiti. Earning his BFA from The School of the Museum of Fine Arts in Boston, Mass., Marka27 became a household name for his “audio canvas” series, a mixed-media collection incorporating live sound. Marka27's artwork has exhibited in galleries across the US and appeared in lifestyle magazines and books such as Graffiti Planet, Burning New York, Play Boy, I am Plastic Too, and the cover of Flux-Designer Toys. Marka27's collaborations include heavy-hitting brands like Levi’s, Pioneer Electronics, Scion, VH1, Disney, Converse and Kidrobot. Breaking more artistic boundaries, Marka27 created to critical acclaim MiniGods: Givers of Divine Sound©, a high-end line of designer vinyl toy speakers. His latest body of work, Retro Native, represents a fusion between ancient art aesthetics and modern urban pop culture. Returning to his roots Marka27 took to the streets and continues to produce magnificent large-scale street art murals for clients and festivals throughout the United States and internationally. 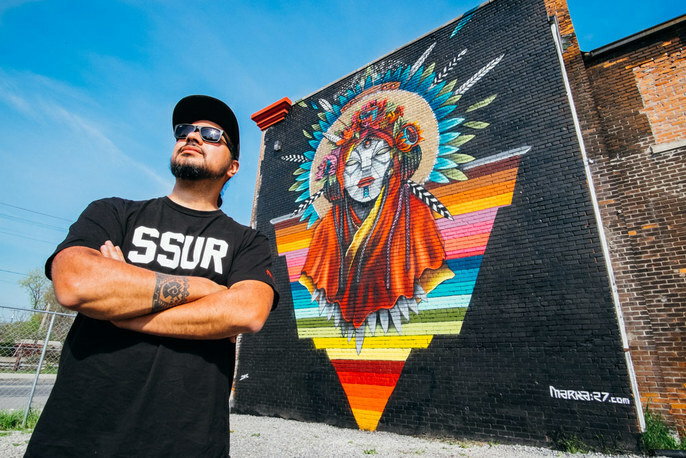 Across all artistic mediums- from street murals to vinyl toys and fine art canvases -Marka27 continues to draw inspiration from his Mexican heritage and experiences with race, culture, and design. Mexican folklore and hip-hop culture form the DNA helix of works by Marka27. Learn more about the artist on his website, marka27.com. GA + Artists For Humanity are pairing up to talk 'personal branding'. Simplify your story and create an effective "identity" with AFH's Design Director, Claudia De Piante Vicin.